Yarn pictured was provided by Shepherd’s Lamb. 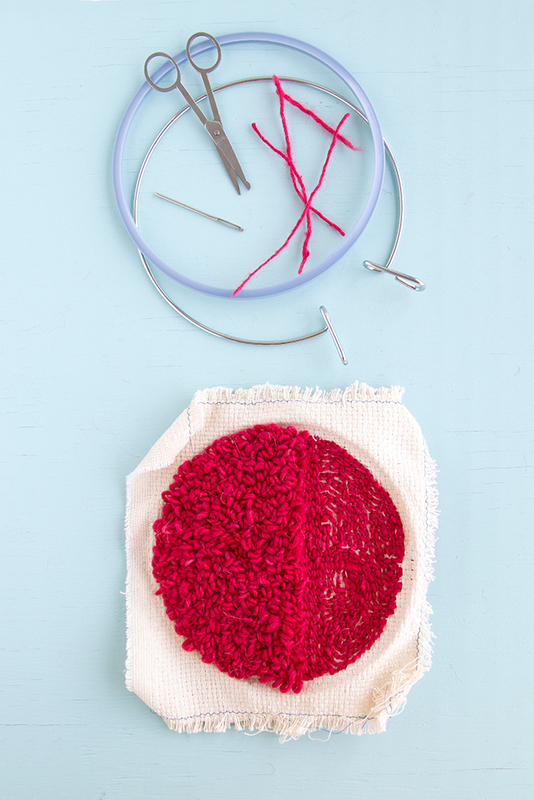 We recently took a look at how to do basic punch needle rug hooking, covering how to start a punch needle project and work with a punch needle tool. So what’s next? What do you do with something once it’s all punch needled? 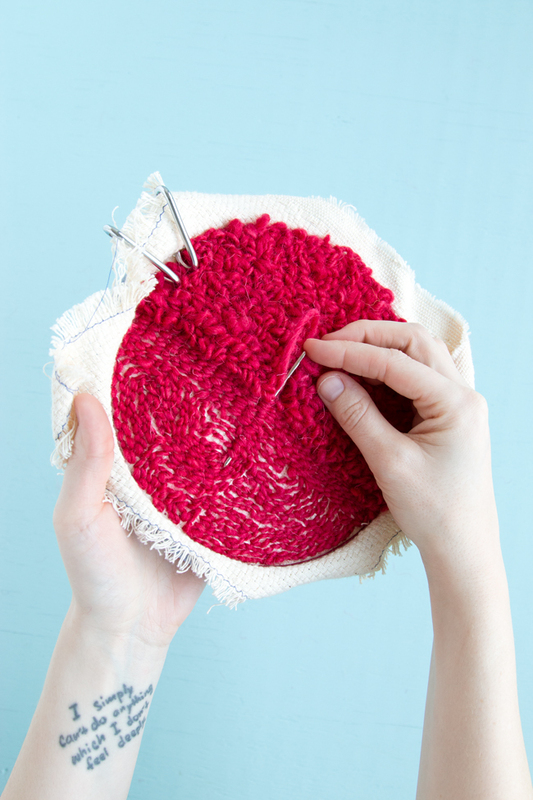 While it all depends on the project in question, today we’re going to tackle how to weave in and secure your ends. 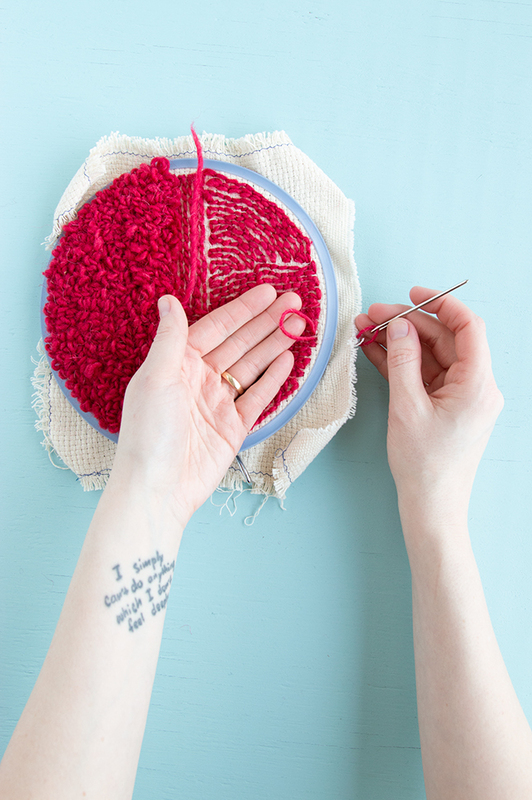 For many punch needle projects, you will need to weave in your ends before securing your canvas in a frame, sewing it to a cushion cover, or whatever finishing your particular project calls for. 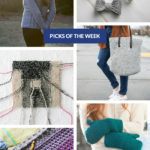 Ready to weave in your ends? Let’s dive in! Note: I use the words “tail” and “end” interchangeably throughout this tutorial. 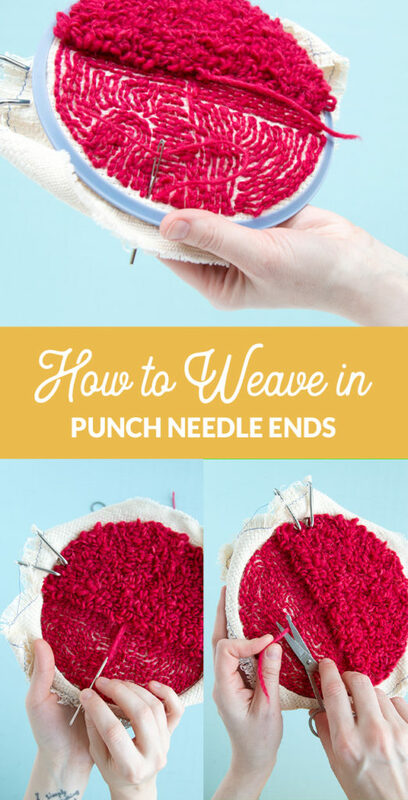 Also note: This is a tutorial designed for beginning punch needlers. 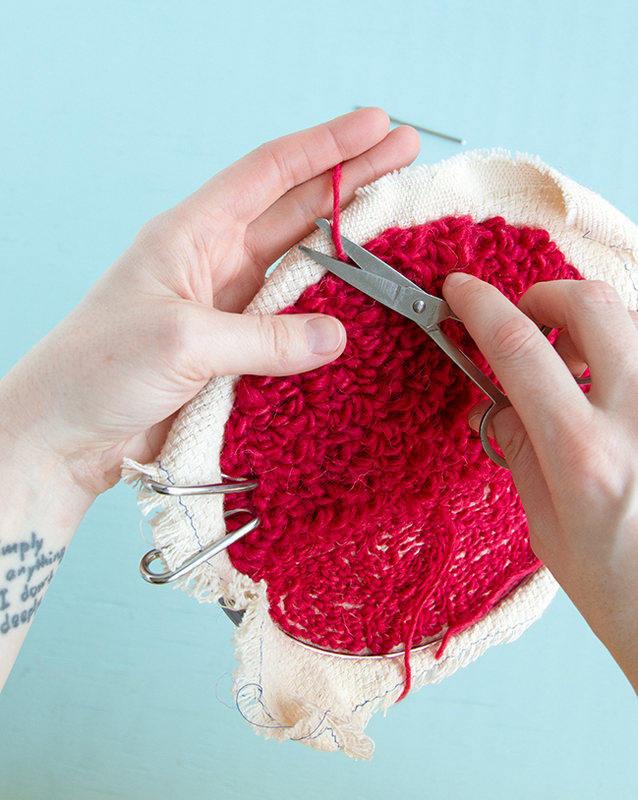 How to hide ends on the right side of a “stitched” section of punch needle. 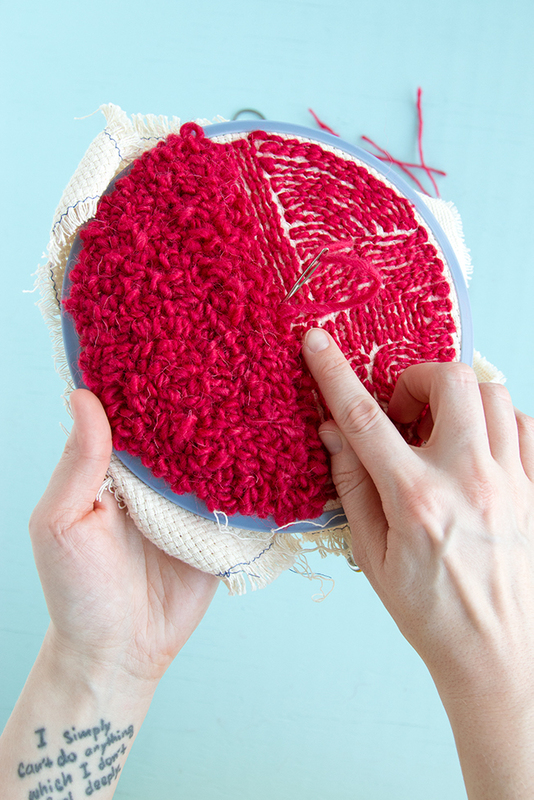 Using a tapestry (large-eyed) needle, bring your ends to the wrong side of your work. 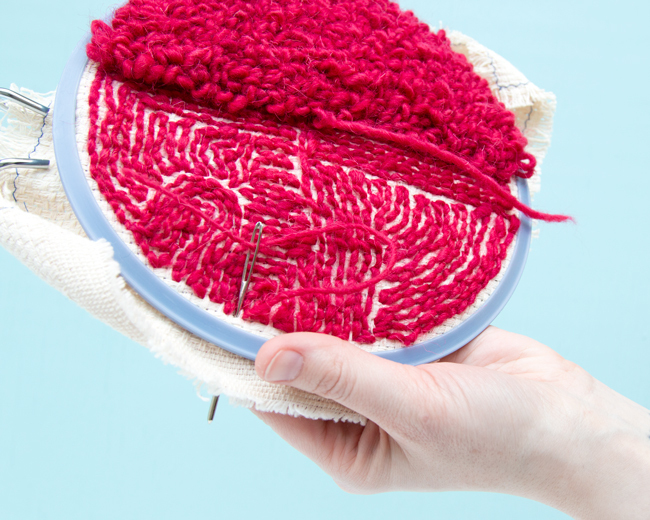 You’ll be sewing a stitch, rather than punching it with a punch needle tool. 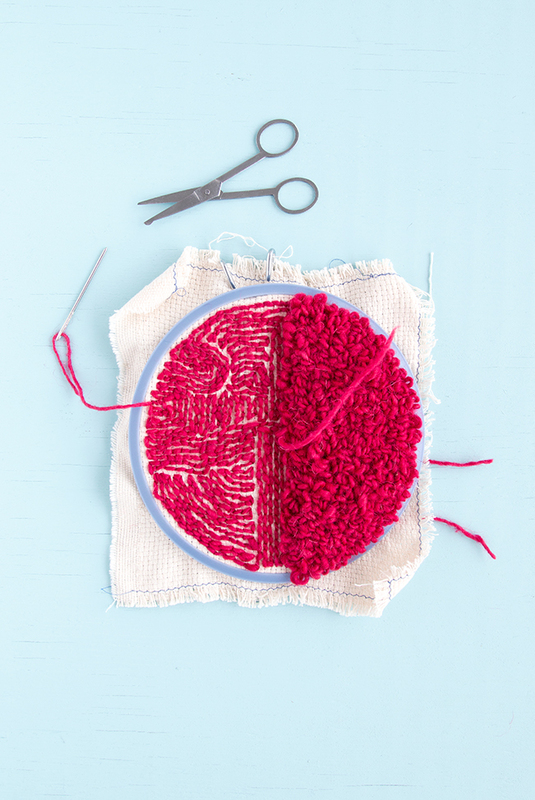 To hide your stitch effectively, it should be approximately as wide as the other stitches on the right side of your work. The right side of my work. The “stitched” section of my work is at the bottom of this photo, and the looped section is at the top. Here, I’m hiding an end on the “stitched” half of the right side of my work by sewing the tail through to the wrong side of my work. Turn your work so that the wrong side is facing you. Being careful not to pull on the tail, trim it with scissors, blending the tail in with its surrounding loops. 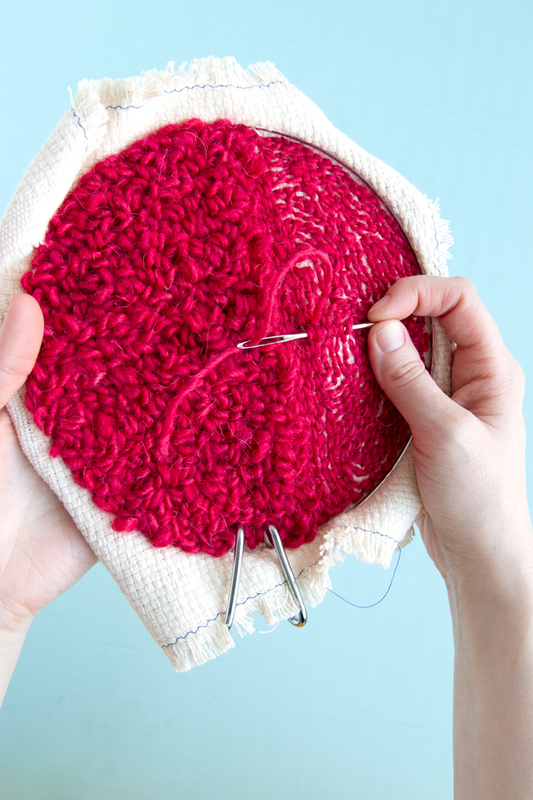 Since the wrong side of a patch of “stitched” punch needle is a patch of loops, you should also be careful not to cut any of the loops in the process. Hiding ends on the right side of a looped section of punch needle. 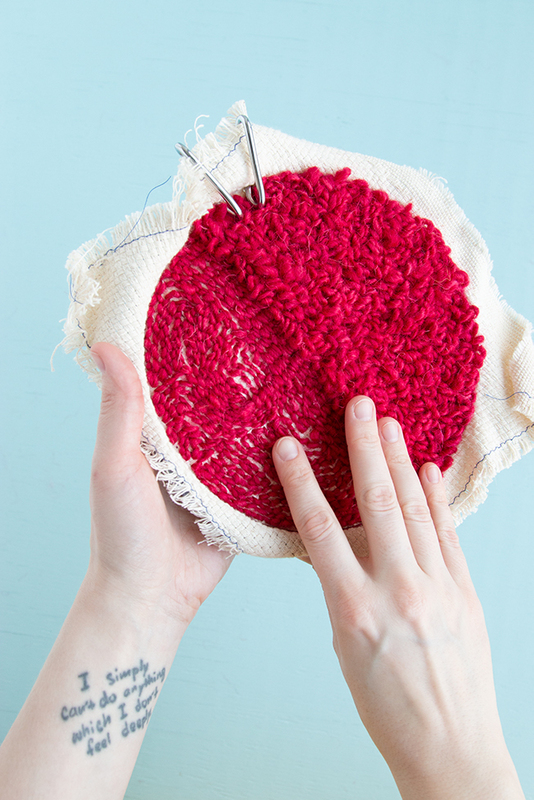 For hiding tails in a looped section of punch needle, it’s just the opposite. Thread your end into your tapestry needle and, hiding it in your right side loops, draw it to the wrong (in this case “stitched”) side of your work. Here, I’m weaving an end into a looped, right side section. Drawing my looped, right side tail through to the wrong side of my work. 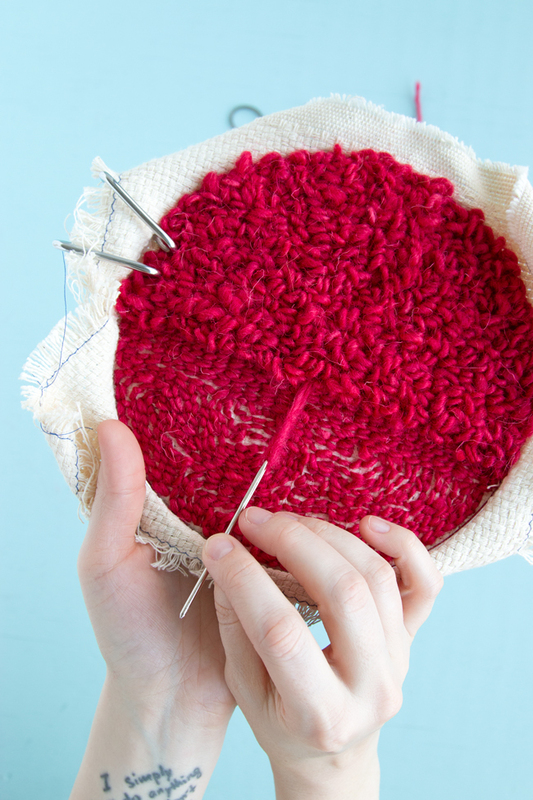 Next, glide your tapestry needle, end threaded, under an inch or two of “stitches” on the wrong side. Be careful not to pull up a loop as you go. 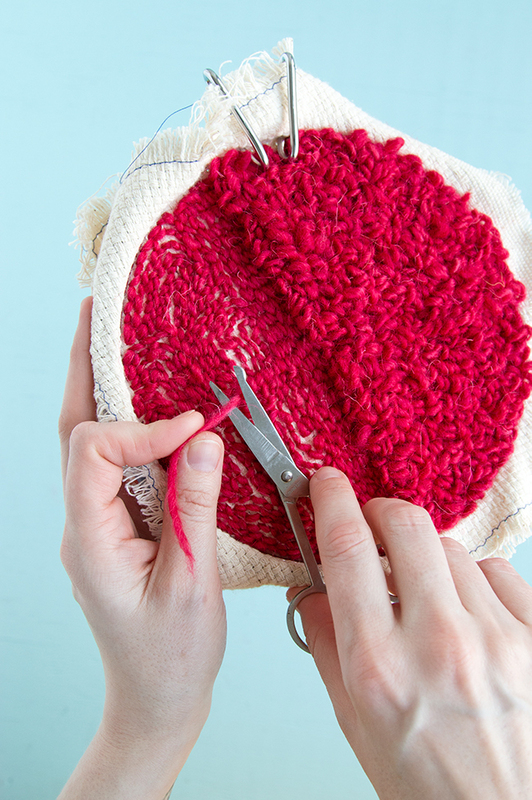 To finish, trim any excess yarn close to your work. Trimming excess yarn from the wrong side of my work. This is what the trimmed tail looks like on the wrong side of my work, as woven into a “stitched” wrong side section. 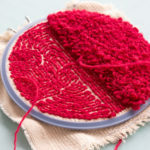 Since the wrong side of your work won’t often be looked at, depending on your project, weaving in these ends is a bit simpler. 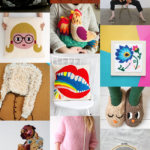 You get to skip the whole artfully-bringing-ends-to-the-wrong-side step! If you’re not already looking at the wrong side of your work, turn it to face you. 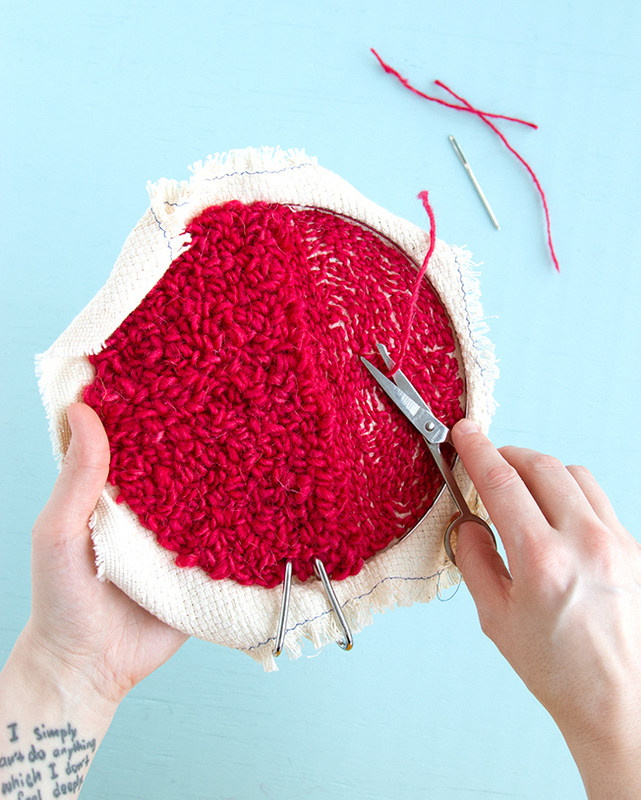 Thread your end onto your tapestry needle and carefully sew it under several stitches, again being careful not to pull out or loosen them. When you’re all stitched, simply trim the excess tail. Weaving a tail into the “stitched” wrong side of my work. Well, I saved the easiest for last! 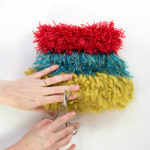 If you’ve got yourself a tail coming out of a looped, wrong side section, you just sew it under a few stitches & trim. Just that simple! Trimming the rest of my tail on the “stitched” wrong side of my work. What happens when all ends are woven in? 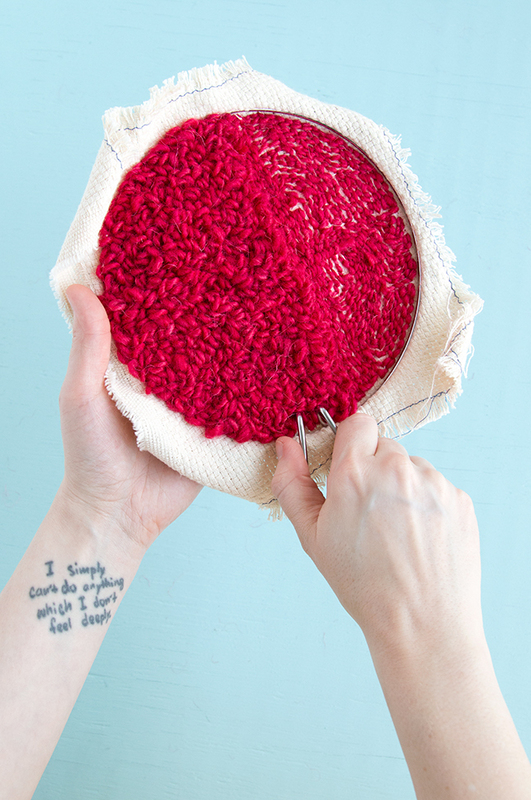 Removing my punch needle project from its hoop. The wrong side of my punch needle project with ends woven in, sans embroidery hoop.